Ben Soo Homestay has been in this business for 20 yrs. This family, family-run homestay offers rare value with a variety of well-kept rooms, all with free tea and toast (breakfast). 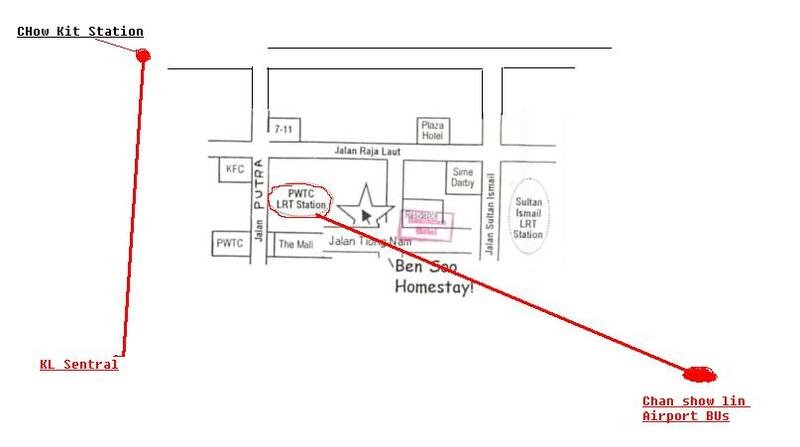 The homestay is a 10 minute walk from both Sultan Ismail and PWTC Star LRT stations. For a small fee, the owner will pick you up from the train or bus stations, and can help you arrange tours and air tickets. From KLIA take express train to KL sentral station. there are coupon taxi or directly take “Monorail PRT line” to Chow KIT. the hotel is 5 minutes walking distance. OR Aiport Bus (7 am to 930 pm) from KLIA to Chan Sow Lin LRT station. From there take train to PWTC station, the hotel is 4 minutes walking distance. When you contact Ben Soo Homestay & Travellers Service, remember to mention Travel Malaysia Guide. Hereâ€™s why. My name is Hakim from Germany. I dont now if you remember me. I have a question , im coming with a good friend for me . we coming 27.08.09 and we want to stay for 3 weeks. can you give me an confirmation for a free room and with a good Price. please send me one e-mail because now im in germany and im coming after tomorrow. Im very happy to find you here on web and i hope we find a accomodation.